Discover Dubai as no one did before ! 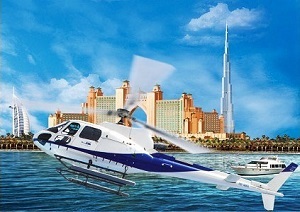 It is shortly what meant with Helicopter Dubai tour, our experience includes picking up from hotel and heading the Helipad to fly over the urban city and exploring the city above clouds. You will fly over best landmarks and highlights of the city like Jumairah Beach, Palm, Creek and Dubai Marina. After discovering the city you will land to find your van ready to be back to hotel reviewing the city landmarks but on land this time ! Tour can be booked on private basis and flight comes on sharing basis.